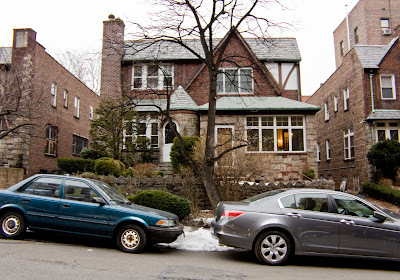 Here they are, three actual houses with yards and driveways, right here in Manhattan. 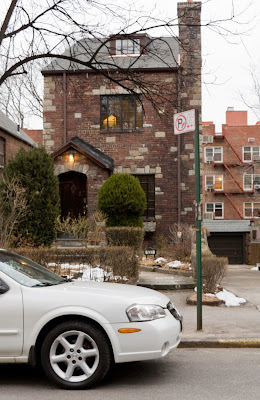 The houses on W. 217th Street all date from 1934 and were developed by a single builder - most share similar floorplans. According to the original notice of construction in the New York Times, they were designed by Benjamin F.V. 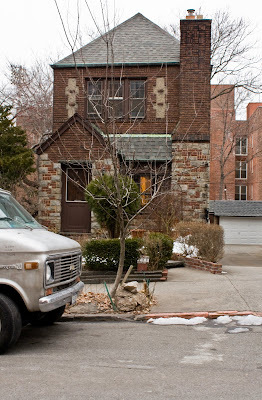 Driesler, an architect who was very active in the residential parts of Brooklyn (many of his buildings are now in historic districts there). The Park Terrace Gardens apartment complex began construction soon afterwards, in 1938, replacing the old Seaman-Dwyer mansion. Note that the street was at one time also known as Park Terrace North but eventually that name fell out of use. So sad to find out that my uncle's house (the first one pictured) was destroyed by fire a few days ago. Luckily, the whole family is safe.